We kicked off the workshops at our Vegas event in August with three cutting-edge content marketing workshops and attendance was standing-room only. Not only that, but participants stayed for all three presentations—not wanting to give up their seats. Before you can join the content marketing race—and begin feverishly cranking out quality blog posts, white papers and email marketing newsletters—you need to get back to the basics. For starters, what is content marketing? Is SEO dead? And if content is really king, then who is the queen? This session focuses on the core foundations of content marketing. By now you are probably onboard with content marketing. You’re all about conceptualizing a best-in-class content marketing strategy that will lead to a surge of website visitors, email open rates and qualified leads. But now comes the real challenge: getting the boss in the corner office to say “yes.” Sure you can rely on cold hard facts, but you will need more than that. This session will focus on how to get upper management buy-in with this latest marketing strategy. 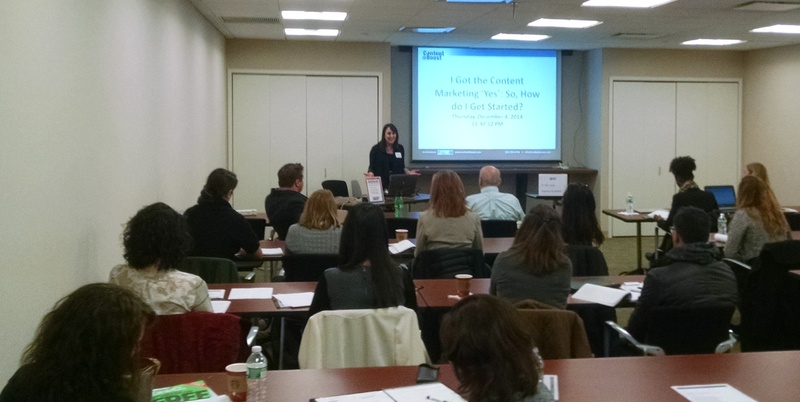 11:30 am -12 pm: I Got the Content Marketing ‘Yes’: So, How do I Get Started? Getting the content marketing “yes” can be exhilarating, but then the real challenge begins: how do you get started? Developing a best-of-breed strategy is a challenge; it’s not something that can be flung together haphazardly. Our final session will walk you through the critical steps for getting up-and-running with content marketing. This year, I have invited two incredible members of my team to present the workshops with me. Digital Content Editor Eric Lebowitz will be leading the first session; our Managing Content Producer Allison Boccamazzo will take the second one; and I will round things out with our final workshop of the day. There’s still time to register for ITEXPO! And if you are going, we hope you’ll start your Tuesday morning with us and a room packed with innovative marketers. Dubbed a “Chatty Cathy” from the time she uttered her first word, Content Boost’s Director of Content Marketing Carrie Majewski (née Schmelkin) is nothing short of verbal. Her love of talking matured into love of writing which inevitably transformed into a love of marketing. Carrie is responsible for overseeing the cutting-edge content marketing beast that is Content Boost—managing brand and editorial strategy, fostering client relationships, identifying new revenue opportunities and striking strategic partnerships. Carrie has worked with a variety of high profile clients on branding and copy creation from Sprint to Panasonic to AT&T to Emerson Network Power. When she’s not busy wordsmithing and debating content marketing versus traditional marketing, you can find her working on her swag in a hip-hop dance class, clogging her DVR with “Friends” reruns and trying desperately to make it up past 9:30 pm on the weekends with her hubby. #OldSoul.